An essential seasoning for your freshly oven-baked or fried chips. 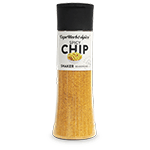 Sprinkle generously over your chips, whilst still hot, ensuring that they are all evenly coated and enjoy the taste of take-away chips in the comfort of your own home. Product of South Africa.